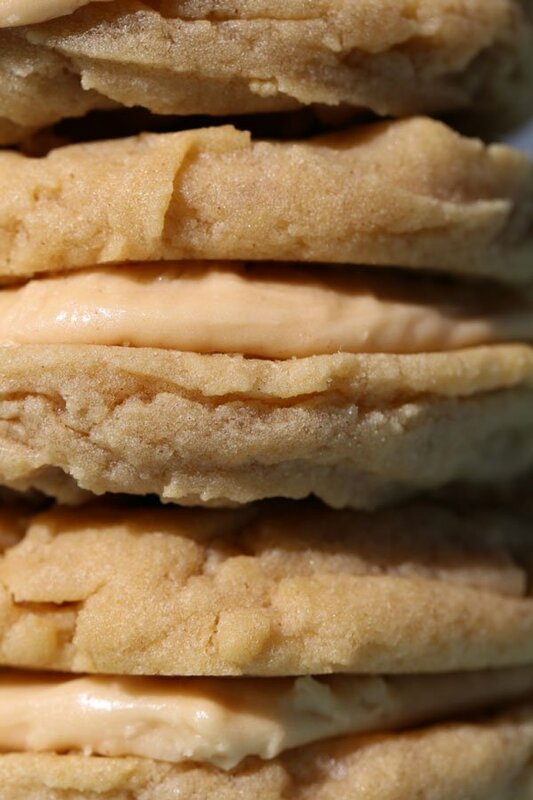 Peanut Butter sandwich cookies are now on my list of favorite treats. I currently seem to be eating in a very healthy way for my meals. However, I’ve also been enjoying the treats I’ve been baking as well, like these delectable peanut butter sandwich cookies. 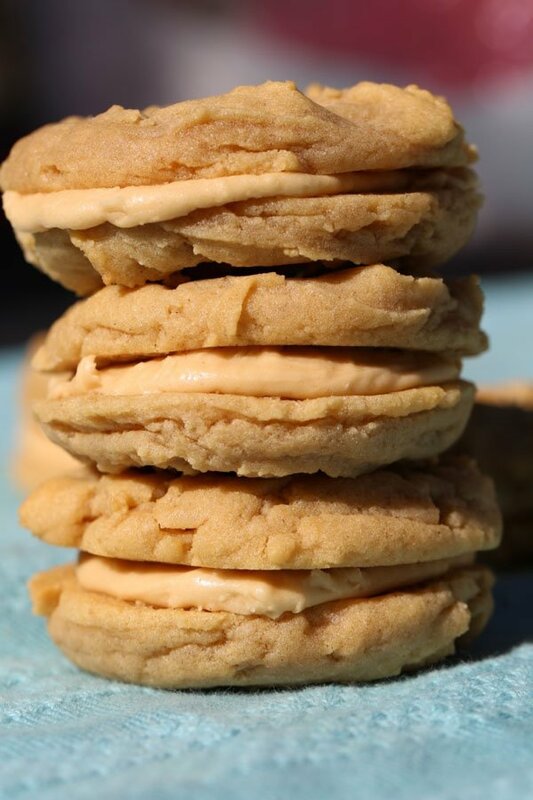 Creamy peanut butter frosting between two freshly baked peanut butter cookies. Heaven. I first thought this recipe would be too much peanut butter, but the icing is delicate enough that it enhances the flavor of the soft cookies. These cookies remind me of the peanut butter sandwich cookies from girl scouts, except better. The girl scout cookies as I recall were peanut butter oatmeal sandwich cookies. One thing I learned is that they are even better when you store in the fridge. The next day after baking these, I had a sweet craving after breakfast, so, of course, I wanted to taste test my peanut butter sandwich cookies from the day before. I was in for a nice surprise to find they were even better after some fridge time. Make sure to completely cool the cookies before spreading the frosting on. If you frost too soon, the frosting melts into the cookie. Not ideal. Don’t forget to put the criss crosses in the top of each cookie with a fork. The cookies are easier to make into a sandwich if they are a little flattened. Close up, you can see how creamy the peanut butter frosting is. I’m thinking these would also be really good with a side of homemade ice cream. 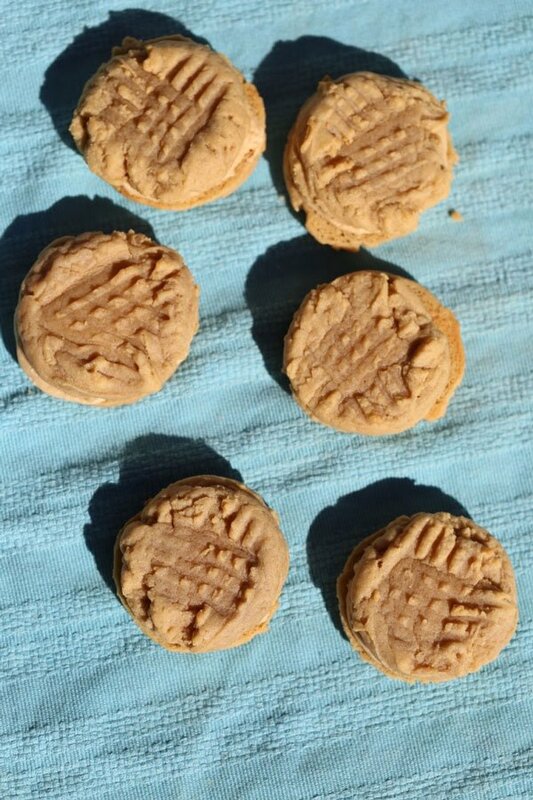 I think I’ll make the homemade chocolate ice cream again soon and pair it with these peanut butter sandwich cookies. And, remember, if you like the girl scout cookies that have peanut butter in the middle of two cookies, you’ll love these. They are a softer, creamier version without the oatmeal. 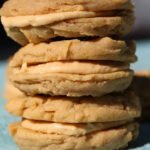 Peanut Butter Sandwich cookies with creamy peanut butter frosting surrounded by soft and chewy peanut butter cookies is a delectable treat that will brighten your day. In a large bowl using an electric mixer, cream together butter, peanut butter, and sugars. Add vanilla extract; stir until well combined. One at a time, beat in each egg until well combined. Slowly add four mixture to wet ingredients, mix until well combined. Scoop dough into 1 inch balls, or use a disher to scoop balls of dough which I highly recommend. I can't believe I ever lived without a disher. Place on ungreased cookie sheet or parchment paper lined cookie sheet. Flatten the balls with a fork. Bake for 5-7 minutes, do not overtake. Cookies will set as they cool. Cool cookies on cookie sheet for 3 minutes; transfer to a wire rack to cool completely. In a large bowl using an electric mixer, cream together peanut butter, powdered sugar, vanilla extract, and milk until well combined. Spread the peanut butter filling on half of the cookies and top each one with another cookie.